Chronic Pain – Is it all in your head? “It’s all in your head.” Don’t you just hate it when someone says that, or even infers it through a not quite concealed sideways glance? So I hope you won’t be offended when I tell you that ALL pain is in the brain, ALL of the time. In other words, regardless of the cause, your pain really is “in your head”. That does NOT make you crazy or your pain any less real. But it does provide some clues to why pain management is so complex and why some things work for some people and not others. 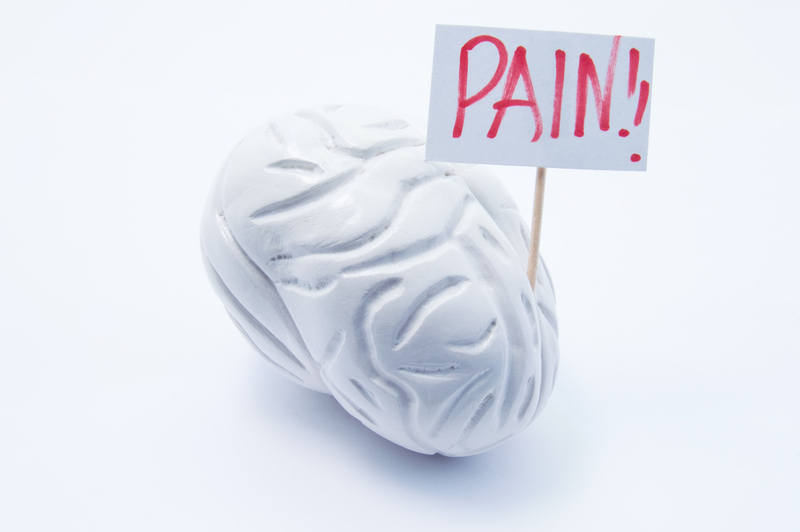 Pain occurs as a result of neural distress signals being sent to the brain. These signals can be triggered by chemical, thermal or mechanical stimuli. But the stimulus alone is not enough to generate the pain response. Once the signal reaches the brain, within milliseconds it takes in information about the situation from your eyes, nose and ears. It will recall past experiences that may be similar. Even your current mood or state of stress can come into play. Rapid-fire internal communication lets the brain decide whether or not the experience warrants a pain response. This complex process makes it quite possible to have an injury without having any pain. A perfect example is a soldier who returns to base after fighting behind enemy lines and is surprised to discover she is wounded. The brain, in its infinite wisdom, decided that there were more pressing issues at hand and diminished the pain response. It’s equally possible to experience excruciating pain without an actual physical injury. In a well-publicised UK case a construction worker fell from some scaffolding and was impaled by a 7” nail that went through his boot. The man was in tremendous pain and required IV pain medication and sedation. On arrival at hospital and removal of his boot, it was discovered that the nail had lodged between his toes, missing his foot altogether. His brain got it wrong….but the pain was all too real. When pain persists for more than 3 months it is considered chronic pain and things get even more complicated. More often than not the tissue damage that initially caused the pain has healed. But the brain just keeps on producing pain. So how do you manage pain that is more about the sensitivity of the nervous system, than it is about structural problems within your body? To tackle ongoing pain it is often necessary to retrain the brain and the nervous system. As we’ve seen the nervous system is a complex beast that is influenced by many things and different for each individual. So retraining the brain is never a simple as taking a pill or booking yourself in for surgery. What’s required is a comprehensive plan that takes into account the many factors that affect the nervous system. Although we still have much to learn about the brain, one thing we do know is that there is a direct connection between the nerve centre in your spinal cord and the emotional centre of our brain. So all your thoughts and feelings have a direct impact on your brain impulses, which in turn can dial up or down your pain levels. Stress in particular has been shown to heighten pain. Unfortunately this can become a vicious circle as constant pain causes stress, which in turn increases your pain. An important part of any pain management plan must focus on emotional well-being and stress reduction. Tools such as simple relaxation techniques, mindfulness meditation and hypnosis have all been shown to reduce pain for some patients. Sometime it can even be useful to explore your personal story, looking at everything that was happening when the pain developed. It is possible you will discover useful links between a worrying period of your life and the period of pain. Your lifestyle also plays a big part in the workings of your nervous system. Unfortunately the “typical” 21st century lifestyle is not particularly good for us and can contribute to an over-sensitised nervous system. So your pain management plan must also include a careful look at your nutrition levels and the reduction of some of our bad habits like smoking, alcohol and junk food consumption. In the past people with chronic pain were told to rest. But these days the best advice is to keep active. This may just sound like the same old advice that doctors give to everyone, but what you feel, how you live and what you eat may directly affect your levels of pain.